This year more than 50 small groups and major organizations in Germany have endorsed the Büchel Is Everywhere campaign, agreeing to make their voices heard using nonviolent civil resistance at the base. Hundreds of individuals and dozens of groups have committed time and organizing resources to the protests which began here last March 26. The groups have engaged in peaceful defiance of official nuclear and conventional war preparations emanating from this eye-of-the-tornado — so to speak. The base is a launch platform and training facility for German Tornado fighter jets which train to use the US H-bombs. 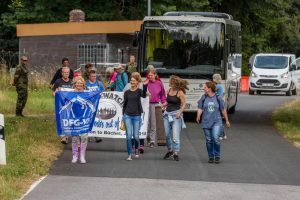 Leading anti-nuclear weapons NGOs from Germany and other countries have come to the camp to join in a wide variety of nonviolent actions, or will do so before Aug. 9 when the “20 weeks for 20 bombs” concludes. The International Physicians for the Prevention of Nuclear War (with 150,000 members in 50 countries), Mayors for Peace (from 7,614 cities in 163 countries), and Parliamentarians for Nuclear Non-Proliferation and Disarmament (with 700 members in 75 countries), have or will send members to camp this year — all convinced that now is the time to get US H-bombs out of Germany for good. 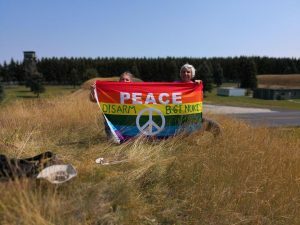 The latest in the long series of protests saw seven anti-nuclear activists, led by one of Germany’s Quaker groups, got through fences and onto the air base’s live runway July 23, just as the Tornado jet bombers were preparing for another day of practice runs. The seven runway occupiers, German citizens all, were eventually detained, ID’d and released after being told they face charges. Although the intruders’ support team warned the base by phone that there were “seven people on the runway,” conventional and social media are this week humming with accusations that the “protesters endangered themselves and the fighter pilots.” Who said irony is dead? While some are calling for heavy charges and severe penalties for the peaceful trespassers, the German Air Force here “shares” the 20-or-so US nuclear gravity bombs (called B61s), and stand ready for a US presidential order to drop them somewhere. Exactly who is endangering whom, when the hydrogen bombs are dangerous to US producers, dangerous to transferring US handlers, dangerous to receiving German Air Force personnel and the surrounding community, dangerous to crews that regularly practice their doomsday missions, and dangerous to people the world over who could be targeted? How many of us have contemplated the deliberate, ongoing planning and preparation necessary for our German air force friends to commit massacres (the only thing nuclear weapons can do) with bombs made in the USA? While the United States and German governments regularly condemn North Korea and Iran for blatantly violating United Nations Resolutions, the detailed anti-nuclear UN General Assembly Res. 1653 from 1961 says, “Any State using nuclear and thermo-nuclear weapons is to be considered as violating the Charter of the United Nations, as acting contrary to the laws of humanity, and as committing a crime against [hu]mankind and civilization.” Not just the “go-in” activists, but 93 percent of German polled want the B61s ousted, and UN resolutions, the Nonproliferation Treaty, and the new Treaty on the Prohibition of Nuclear Weapons are reason enough to stop practicing nuclear attacks and finally get rid of the US bombs. 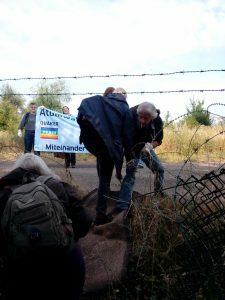 BÜCHEL, Germany — On Sunday, July 15, eighteen people — seven from the US, six from Germany, four from The Netherlands, and one from England — cut holes in fences in five different places in broad daylight and clamored inside Germany’s Büchel Air Force Base, home to 20 US nuclear weapons known as “B61s.” The whole group was later released without charges. (Nukewatch helped organize a nine-person US delegation to the protest.) Full disclosure: Bonnie Urfer and I were among the five small groups that got into the base. The 18 people detained were released from the military bus. In bright sunshine around 11:00 a.m., we cut through chain-link fencing and razor wire to gain entry to the nuclear weapons base, and all 18 went inside uninterrupted and walked around inside carrying banners, some for over an hour. Several walked as far as the airbase runway, built for high-speed Tornado jet fighters. 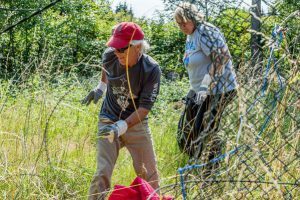 Three activists, including Susan Crane of Redwood City, California, walked through two unlocked interior gates and into a high-security zone containing four nuclear weapons bunkers. The three climbed to the top of one bunker where they went unnoticed for an hour, eventually unfurling a banner, “Disarm B61 Nukes,” — a reference to the 20 US nuclear gravity bombs deployed at the base — that alerted guards to their presence. The mass action was the highpoint of “International Week,” just one part of a 20-week-long series of protests against the B61s sponsored by the German-wide coalition “Büchel is Everywhere!” The 50-group coalition has endorsed the use of civil resistance, like go-in actions at the base, in pursuit of its three goals: 1) the removal of US nuclear weapons from Germany; 2) the cancellation of plans to replace today’s B61s with new ones; and 3) German adoption and ratification of the Treaty on the Prohibition of Nuclear Weapons (TPNW). 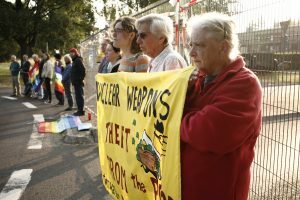 In a prepared statement, Sunday’s disarmament activists also urged Germany and the United States to ratify the new TPNW, which was endorsed by 122 United Nations member states July 7, 2017, and reminded readers of the 2010 cross-party resolution in the Bundestag calling on the government to oust the remaining nuclear weapons. Legal experts argue that the United States’ Cold War-era “nuclear sharing” agreements violate the 1970 Treaty on Nonproliferation of Nuclear weapons (NPT). Government officials answer that spreading US H-bombs to five European allies predates the 1970 non-proliferation treaty, and is therefore “grandfathered in” — an insult to grandfathers everywhere. 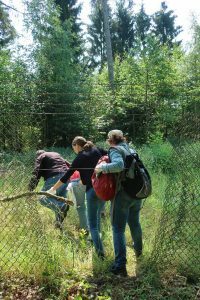 On Sunday, July 15th 2018, eighteen people from four different countries cut through fences to reclaim German Air Force Base Büchel, which hosts about 20 U.S. nuclear bombs. The activists are from the USA (7), Germany (6), The Netherlands (4) and England (1). 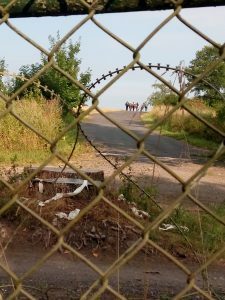 The peace activists cut through razor wire and some other fences and several made it to the runway; three activists walked to a nuclear weapons bunker, and climbed up to the top where they were undetected for an hour. All 18 were eventually found by soldiers, handed over to the civil police, ID checked, and released from the base after 4-½ hours. This action was part of the international week during the 20 weeks of protests by the German campaign ‘Buechel is everywhere! Nuclear weapons-free now!’. The campaign demands the withdrawal of nuclear weapons from Germany, the cancellation of the upcoming nuclear modernization and compliance with international treaties. On this air force base, German pilots stand ready to fly Tornado fighter jets with U.S. B-61 nuclear bombs and could even drop them, on orders from U.S. President Donald Trump on targets in or near Europe. This “nuclear sharing” within NATO is in violation of the Non-Proliferation Treaty, which does not allow Germany to take nuclear weapons from other countries and forbids the U.S. from sharing its nuclear weapons with non-nuclear weapons states. The activists demand of their governments that they sign the new UN Treaty on the Prohibition of Nuclear Weapons, of July 7th 2017, which was supported by 122 UN members. “Civil disobedience is often necessary to make important changes possible, like the abolition of slavery, the women’s rights to vote, and the civil rights movement,” said John LaForge, co-director of Nukewatch, the Luck, Wisconsin peace group, which helped organize a 9-person US delegation to the protest. The nonviolent campaign is part of the ICAN network, which received the Nobel Peace Prize in 2017, and recently called for nonviolent direct actions on nuclear bases to urge more countries to sign the treaty ban. The Dutch activist Frits ter Kuile said: “My motivation is the commandment to love one’s “enemies”, and the Nuremberg principles stating that everyone is responsible for the crimes their government commits. We have the duty to take down the fences that protect nuclear mass destruction, and reclaim the land for the people and their real needs”. 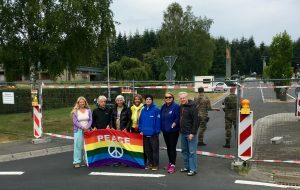 Peace and disarmament activists including a delegation organized by Nukewatch joined an action at Büchel is Everywhere, gathering at the Büchel airforce base in Germany last weekend. 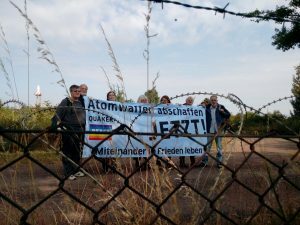 German hosts Büchel is everywhere—nuclear weapons-free now posted pictures and an update from the action. We feel an overwhelming responsibility to warn you of the unlawful nature of your work in support of the mission of Büchel Air Base, i.e., preparations for nuclear war. It is likely that your superior officers have inadequately informed you of the legal implications of your work here. Participation by individual military or civilian personnel in actions they know to be or could assume to be unlawful cannot be justified by citing superior orders. The endorsement by the United States and Germany of the Geneva Conventions, Air Force Service Manuals, and the Nuremberg Principles make the refusal of unlawful orders a legal obligation. Taken together, the Constitution of the United States, the Nuremberg Principles, the Geneva Conventions, and your military service manual(s) prohibit citizens or military personnel from cooperating with policies they know to be unlawful. Furthermore, U.S. and German judges are competent and responsible to restrain the execution of internationally outlawed government policy. With the U.S. Constitution’s “Supremacy Clause” and expert legal advice in mind, we hereby warn and appeal to the men and women of Büchel Air Base to stop participating in the perpetuation of crimes against peace, crimes against humanity and war crimes, as detailed in the following international legal prohibitions; and we urge you to end your personal participation in the U.S. and German governments’ unlawful nuclear war planning. • The 1949 Geneva Conventions¬ on the laws of war prohibit reprisals, as do the U.S. Uniform Code of Military Justice, the Army field manual The Law of War, the U.S. Law of Naval Warfare, and U.S. Air Force policies on International law: The Conduct of Armed Conflict and Air Operations. • The 1868 Declaration of St. Petersburg limits all warfare to military forces alone. • The 1899 Hague Regulations which especially prohibit the employment of poison or poisoned arms, the killing or wounding treacherously of individuals belonging to the hostile nation or army, and the employment of arms, projectiles, or materials of a nature to cause superfluous injury. • The 1925 Geneva Gas Protocol which prohibits the use of poisonous or other gasses, and of all analogous liquids, materials or devices. • The 1928 Kellog-Briand Pact which condemned and renounced recourse to war as an instrument of national policy. • The 1948 Convention of the Prevention and Punishment of Genocide which criminalizes all “conspiracy to commit genocide” against a national, ethnic, racial, or religious group. • The 1968 Treaty on the Nonproliferation of Nuclear Weapons (NPT) at Article I prohibits the transfer of nuclear weapons to other states, and at Article II prohibits the reception of nuclear weapons from other states. So-call “nuclear sharing” agreement by which Germany receives, deploys and trains to use U.S. B61 hydrogen bombs is an open violation of this Treaty by both countries who are both signatories to the NPT. We understand our duty to obey the U.S. Constitution, Nuremberg Law, and German and U.S. statues which taken together require that we act to prevent unlawful government actions conducted in our names, even war crimes, before the fact. As an act of conscientious objection to nuclear war preparations, and as an act of crime prevention and responsible citizenship, we are here peacefully resisting the unlawful conspiracy by the United States and German Air Forces to commit massacres using nuclear weapons. We are here on behalf of all those who are unaware of the threat that such planning poses to life and liberty, who are unaware of the binding legal prohibitions that outlaw planning for nuclear war, or who feel powerless to take effective action against the Büchel Air Base’s illegal nuclear war planning and preparations. We call upon all men and women of good faith to join us in the endeavor to prevent and ban the use or threatened use of nuclear weapons, to participate in nonviolent public resistance to nuclear war planning, and pursue the abolition of all nuclear weapons.